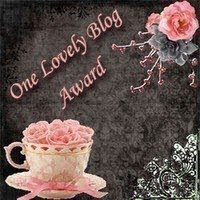 I Want To Read That: One lovely Blog Award. Loads of thanks to Andrea @ Buried in Books, Yay Reads and Carla @ The Crooked Shelf for giving me this award. Here are the rules: Accept the award, post it on your blog together with the name of the person who has granted the award, and his or her blog link. Pass the award to 15 other blogs that you’ve newly discovered. Remember to contact the bloggers to let them know they have been chosen for this award. Oops - turns out I can't count and have done 16! Thank you! I will work on passing this on! I love your blog too! Thanks for passing it along to me! I really appreciate it. :) I will also start working on a list to pass this on. Thanks so much! I'll pass it on soon! Thank you very much! At first I was really good at doing awards but lately I've been very bad! Thanks again for thinking of me! Awww, thanks so much for the award, I really appreciate it! Aww, thank you! Made my morning.